For years, the Republican Party leadership has been just fine with the racist, xenophobic rhetoric coming from GOP Congressman Steve King. That’s suddenly changed this week, and the GOP leadership is officially branding King as a racist, just one week before the midterm elections. So what’s really going on here? Clearly, the GOP leadership couldn’t care less about racism or xenophobia, or else it wouldn’t still be standing behind Donald Trump. So why draw the line? Obviously, this is some kind of cold, calculated, strategic move. But the question, of course, is why now. The polls say that the race between Steve King and his Democratic challenger J.D. Scholten is very close. So why would the GOP publicly condemn a GOP candidate who appears to have a perhaps 50-50 chance of winning? There are a few different plausible explanations. The GOP could have internal polling that says Steve King is going to lose, and so it’s trying to look good by throwing him under the bus beforehand. It’s also possible that the GOP has given up any hope of retaining control of the House, and therefore doesn’t care if King wins or not, and is hoping to bolster its prospects in swing state Senate races by suddenly painting itself as non-racist. 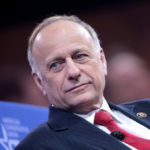 Regardless of the specific circumstances that led the Republican Party to decide to throw Steve King under the bus, here’s the kicker: if he wins reelection, the GOP will be stuck with a guy in Congress after publicly branding him as a racist. That would not only make for an awkward situation, it would hand the Democrats an easy talking point about how even the GOP admits it has a racist in the House. This would suggest that, in spite of public polling, the GOP does not think King can win. That said, elections are decided by who shows up and votes. You can follow Democratic candidate J.D. Scholten here.